This November, Bundaberg Rum celebrates 130 years of crafting world-famous, award winning rums with a special Small Batch Spiced release. The great news for us, is that we’ve got our hands on a bottle. The great news for you is that you can too, if you read your way to the bottom of this article, you can find out how. We’ll also give you some excellent suggestions on the best ways to drink it (in a glass isn’t one of our suggestions, although it is very sensible). Keep your eyes peeled for our favourite two cocktail recipes with this special spirit. 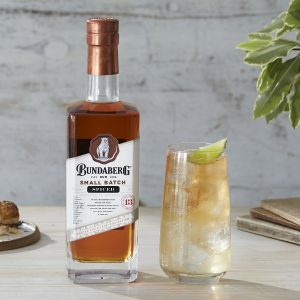 Bundaberg Rum Small Batch Spiced has been crafted by blending the finest aged reserves with rum mellowed to perfection in heavily charred American oak barrels, before being infused with notes of 13 different spices, fruit nectars and citrus zest to produce a perfectly balanced and intricately complex spiced rum. 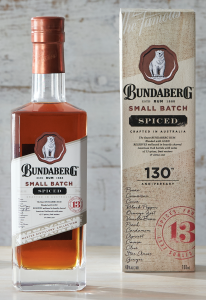 Marking a huge milestone from Australia’s iconic rum pioneer, this is the fourth release in the award-winning* Bundaberg Rum Small Batch series. “Small Batch Spiced is one of our best rums yet. It celebrates 13 decades of craftsmanship by combining 13 specially selected spices with locally made, world class premium rum. 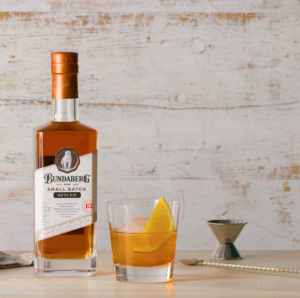 Bundaberg Rum is an Australian born craft distiller, and we’re so excited to release new Small Batch Spiced as a thank you to our fans in Australia for their support over the years,” says Karl Roche, Marketing Manager for Bundaberg Rum. Bundaberg Rum is one of the few single estate distilleries in the world using all locally sourced ingredients from Bundaberg, Australia. The rum has won 144 awards in its 130 years of rum creation. Bundaberg Rum Small Batch Spiced (700ml, 40% ABV, RRP $69.95) is available to purchase at the Bundaberg Distillery Store, online and nationwide including selected duty-free outlets now. ← AMAZON CAN NOW HELP LOOK AFTER YOUR PET!